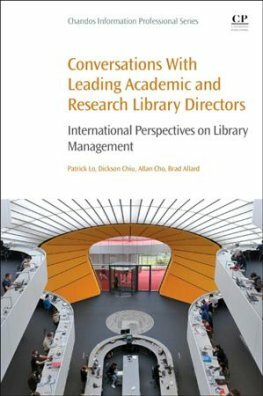 Conversations with Leading Academic and Research Library Directors: International Perspectives on Library Management presents a series of conversations with the directors of major academic and research libraries. The book offers insight, analysis, and personal anecdote from leaders in the library field, giving a unique perspective on how the modern library operates. Readers will learn about the most up-to-date trends and practices in the LIS profession from the directors of 24 internationally acclaimed academic and research libraries in Germany, Hong Kong, Ireland, The Netherlands, New Zealand, Russia, Singapore, and the UK and USA. This is the first book focusing on leaders and managers of library institutions to offer a global outlook. Facing the need to respond to the expectations of changing populations that librarians strive to serve, this book aims to develop a new understanding of the core values of academic and research libraries, and asks how librarians can innovate, adapt, and flourish in a rapidly shifting professional landscape.